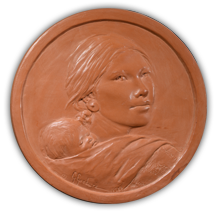 The Edward C. Rochette Money Museum received an exciting donation in late 2017: items related to the production of the Sacagawea dollar from the studio of acclaimed sculptor Glenna Goodacre. 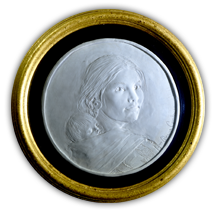 The donation is a great addition to the ANA’s collection of plasters, galvanos and other production-related objects associated with famous numismatic engravers and sculptors such as Gilroy Roberts, John Sinnock and Adam Pietz. 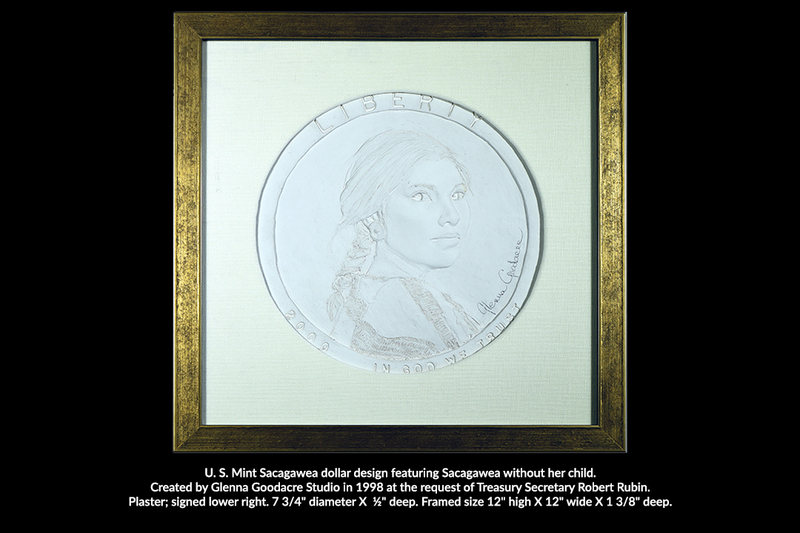 The story of the Sacagawea dollar began in 1997, when the U.S. Treasury realized the stock of Susan B. Anthony dollars (last struck in 1981) was critically low, and because these dollars were often mistaken for quarters. The subsequent United States Dollar Coin Act of 1997 required a new circulating gold-colored dollar coin similar in size to the Susan B. Anthony dollar. Secretary of the Treasury Robert E. Rubin created the Dollar Coin Design Advisory Committee responsible for coming up with a design with the following characteristics: it must not depict a living person, it must depict one or more women, and it must maintain a dignity befitting the nation’s coinage. 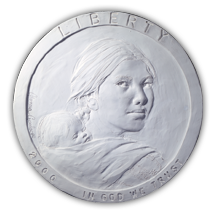 In July 1998 the committee recommended that Sacagawea, the Shoshone woman who played a crucial role in the success of the Lewis and Clark expedition, should appear on the new coin. 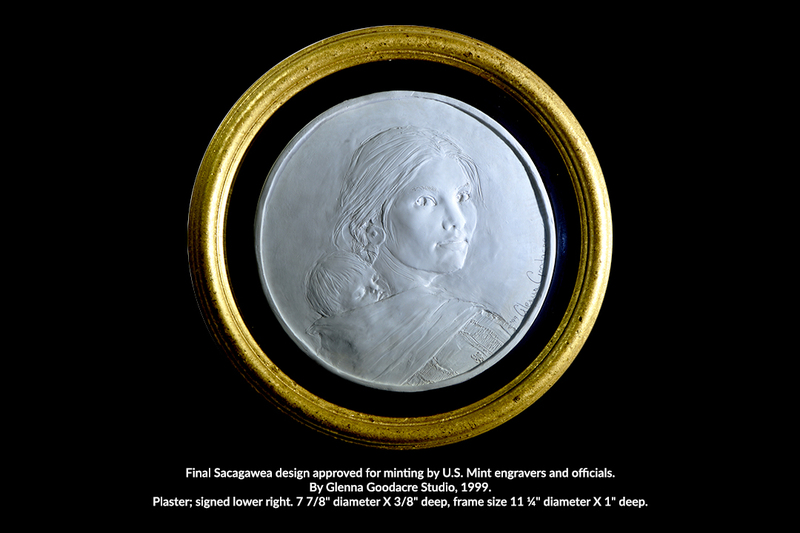 The Mint requested design submissions and in May 1999 the United States Commission on Fine Arts selected the final designs: the obverse by Glenna Goodacre and the reverse by Thomas D. Rogers, Sr. The coins were officially released for circulation in 2000 and were produced until 2008. 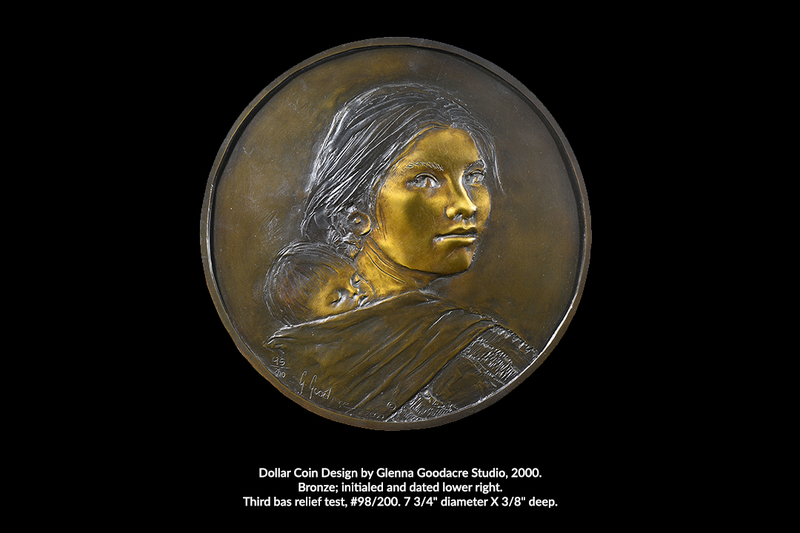 Goodacre’s Sacagawea design is still used today for the obverse of the ongoing Native American dollar series. 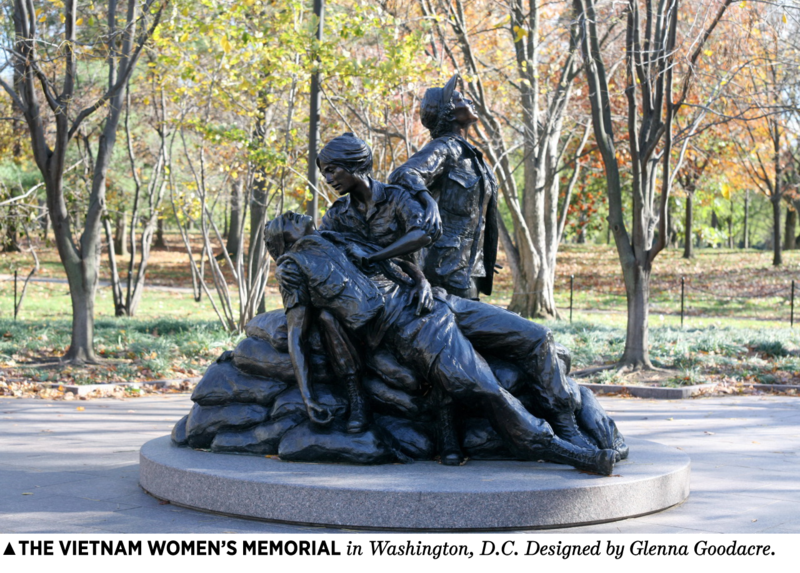 In addition to her Sacagawea design, Glenna Goodacre (1939-present) is known for her bronze sculptures – the most famous being the Vietnam Women’s Memorial in Washington, D.C. (pictured). The Texas native graduated from Colorado College and established a studio in Santa Fe, NM, where she spent most of her professional life. She retired in 2016 after a 50-year career and donated her tools, clay and equipment to the New Mexico School for the Arts. In 2008 her hometown of Lubbock, TX dedicated Glenna Goodacre Boulevard near Texas Tech University. 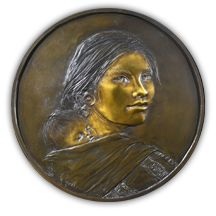 The ANA’s Sacagawea collection was donated by Daniel Anthony, Goodacre’s business manager for many years, after a conversation with former ANA President Jeff Garrett. 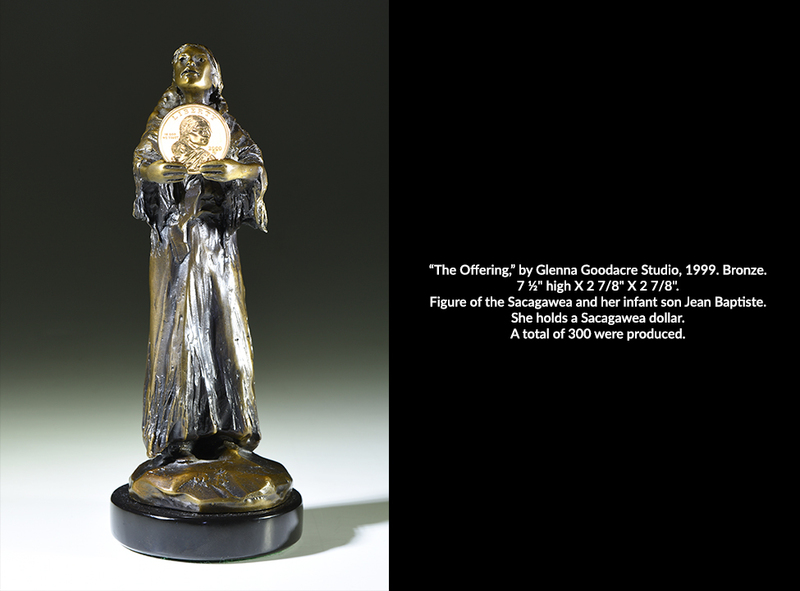 The donation includes one of three plaster-casts of the original design submitted by Goodacre, along with a plaster of the final design, a test piece in bronze to study the design with a polished finish, and examples of the first coins struck by the Mint. 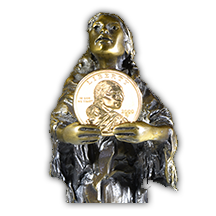 “The Offering” – a beautiful small bronze statue showing Sacagawea looking up to the heavens while holding her dollar up and out in front of her. 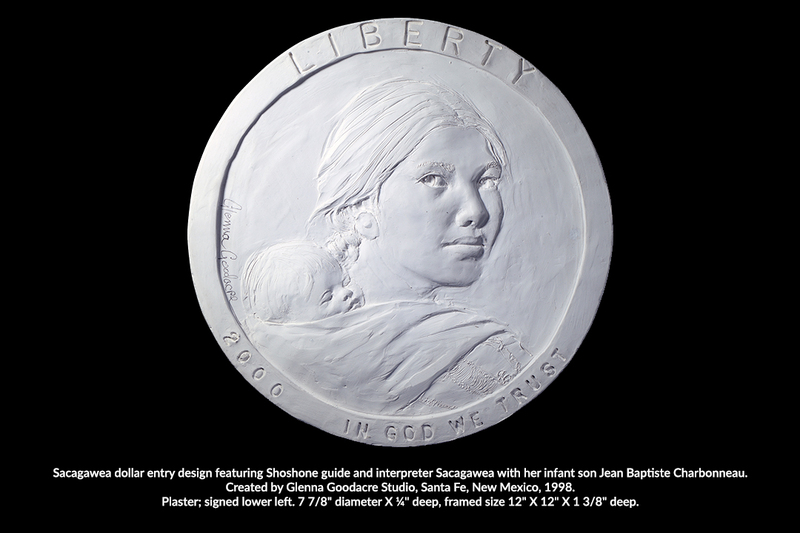 A plaster showing an alternate version of the Sacagawea design, requested by Secretary of the Treasury Rubin, without Sacagawea’s baby Jeanne Baptiste on her back. Produced in 1998, it was much less popular than the design with the child. 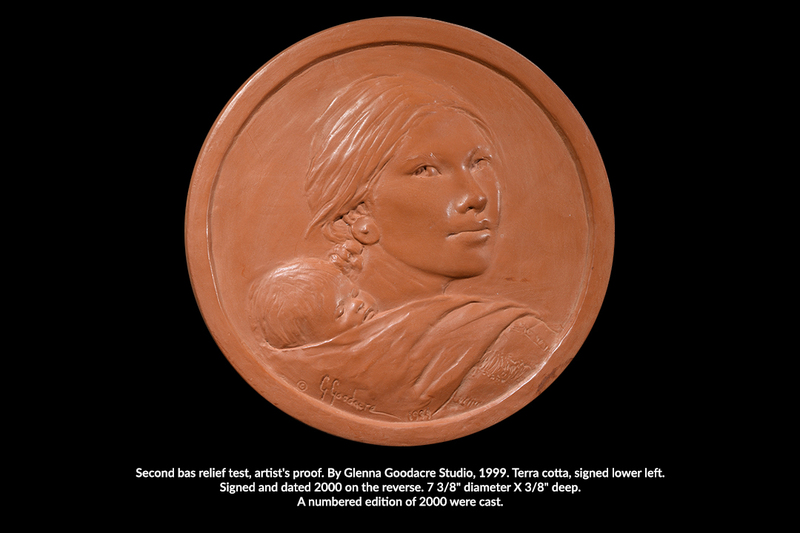 A terra cotta rendition, used as a test piece to study the relief of the design. 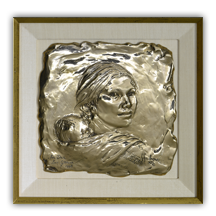 A large (7 ¾”) cast bronze of the final design. Explore items from this donation by using the gallery below. Thanks for such a great blog! Really interesting and wonderful donation! Great story and a fantastic donation.. Thanks for the history!! Thanks for the write-up. 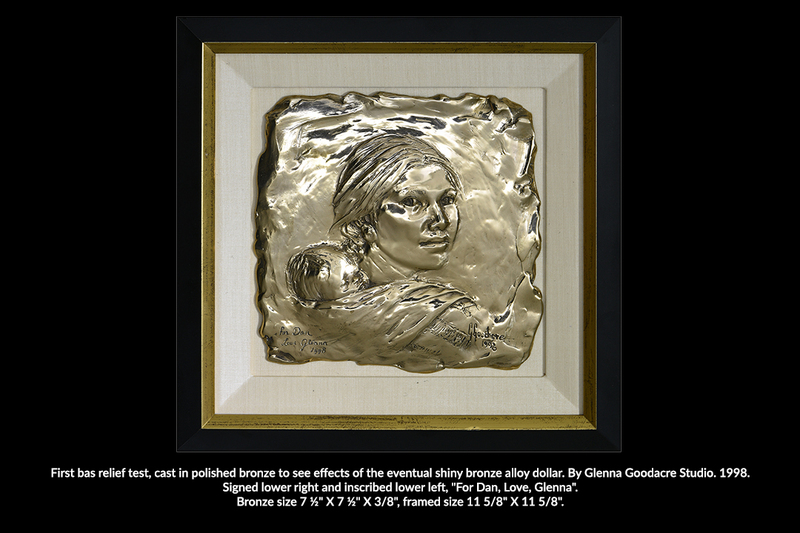 Glenna Goodacre stands apart from other artists whose works include productions of the US Mint. She is a "media person" in her own right, connected to both Washington and Hollywood. 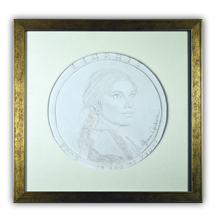 In numismatics, she adds a dimension to an otherwise mundane and prosaic art form. Her statuary also draws monumental art out of the "frozen man standing" formula. Thank you for reminding us of the story behind this coin. I am glad to see more recognition is being given to sculptors/designers. A gift well deserved and absolutely a great part of our history. Those are great donations and I only wish I could see them some day. What a great man to donate such wonderful items. And a personal thank you to you for telling us and showing us. There in a place were many people can and will be thrilled when they see them. Thank you very much for the information and the story and the pictures. Mike.